Copy of an original souvenir card of the September 15th dedication. If you know where to look as you come up the monastery driveway you will see the cornerstone with the date November, 1925. During that year, (the groundbreaking had been on Annunciation Day the same year) hopes were high as plans for a 15 altar basilica honoring our Lady of the Rosary were underway. Soon it became apparent that construction would have to come to a temporary halt until a building debt of $120,000 was liquidated. What the Sisters didn't know was that the Great Depression was right around the corner and that temporary meant 12 years! In 1937, the Nuns received permission from Archbishop Thomas Walsh to resume building but with the caveat that the entire monastery and church had to be built on the existing foundation (what was the crypt chapel) and within a specified budget. Thanks to the resourcefulness of Mother Mary of Jesus Crucified and the new architect, Luigi Vivoli, the first stipulation was possible but the second, that of the limited budget proved not to be. There were tensions and historians now surmise that Archbishop Walsh's desire to finally finish the Cathedral of the Sacred Heart may have played a part in his stipulations to the Community. Finally, however, in God's Providence the monastery and church were completed in 1939. 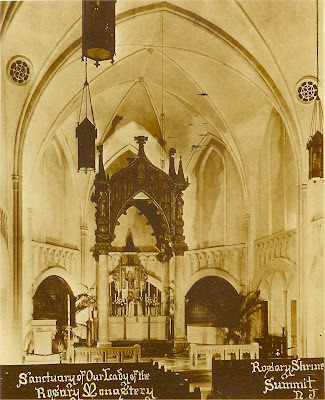 On Trinity Sunday, June 4, 1939, the community, still in the old house, received a call from the Archbishop's secretary, Monsignor John Delaney just as they were sitting down for supper. He would be over in a few moments to bless the new building! So, supper was left to get cold as the nuns grabbed their cappas and made their way through the fence to the new building. Because of the strict laws of enclosure at that time, for most of them this was the first time in the new monastery. Monsignor Delaney arrived and he was in a hurry. The Nuns followed him throughout the house breathlessly responding, "Ora pro nobis! Ora pro nobis!" to the Litany! The ceremony over, it was about 8:30 when they put away their cappas and heated up their supper! A few days later the nuns began the long-desired move into what seemed like an enormous building. all times, and even to come here to make private visits to Our Lord. Come here often, come every day to visit Jesus in the Blessed Sacrament." We thank our Lord for the gift of 70 years in this monastery and pray that He will be loved and adored here for many, many more years! HOW ARE THINGS IN GLOCAMORA?